Above is a small selection of featured works from our collection. 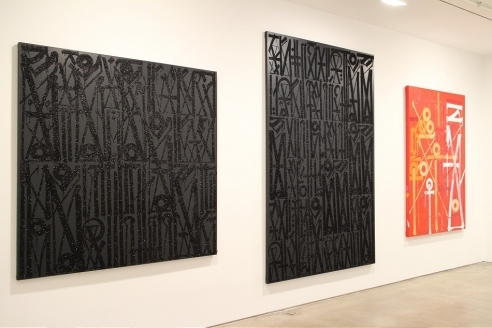 For information about other available works by RETNA please contact the gallery at info@hgcontemporary.com. Marquis Lewis, known by his internationally-recognized tag RETNA, accesses spaces between typographic, text-based imagery and abstract esoteric states using a singular, mysterious script. Each block of text is a sophisticated system of hieroglyphs, calligraphy and illuminated lettering. With influences extracted from Arabic, Egyptian, Hebrew, Anglo-Saxon (or Old English) and Native American mythologies, RETNA's unique vocabulary communicates a personal form of poetry; one that reflects the harsh realities of urban life, while granting itself access to metaphysical considerations. RETNA employs ancient totemic symbologies as a baseline, overlaid with rhythms from the urban jungle. These are sourced from his youth in Los Angeles, born from Pipil (western indigenous El Salvadorian), Cherokee, Spaniard and African-American bloodlines. These subcultures factor into the physical product of his labors, often accompanied in the studio or on the street by a stream of sounds (whether it be music, ambient city noises or anonymous passers-by). It is this multimedia experience that is laid onto the painted surface for RETNA: auditory and visual content manifested in real-time. As the dynamic of street art within the gentrified urban structure become increasingly blurred and complex, their foundational beliefs and symbols will take on new meanings. RETNA’s work reflects these changes with every successive project. Whether staging an international traveling exhibition appealing to the perpetually anonymous, high-roller commercial collector or showing alongside artists such as Keith Haring, Os Gêmeos, and Barry McGee on the famed East Village Houston-Bowery wall, RETNA’s ultimate aim is carefully concealed. One certainty, however, is his dedication to an artistic practice rather than abandoning principle for principal. 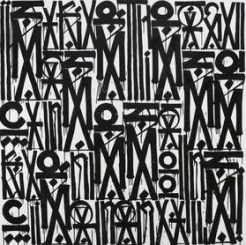 RETNA’s language is markedly softer in tone and appearance than more traditional forms of street graffiti: the elegant swoops of ink-like letters and the poetic statements themselves seemingly adhere to messages of intellectual contemplation and restraint. 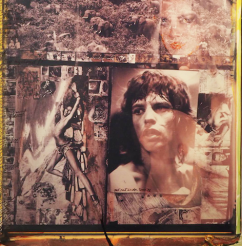 RETNA’s use of a feather-tipped paintbrush owes to the airy movement of the characters. According to the artist, this conscious choice of material is also a nod to the Spirit of the Falcon, an ancient Egyptian totemic emblem signifying success and victory. A steady stream of references to victory and transcendence of worldly hardships reside in his work, perhaps in and of itself a collective plea from the depths of the streets to the canopy of fame and fortune. At the risk of delving too deeply into new-age philosophy or potentially alienating a base audience rooted specifically in urban environments, RETNA’s messages are masked in ciphers: words and meanings that are never immediately revealed nor capable of being accurately translated. 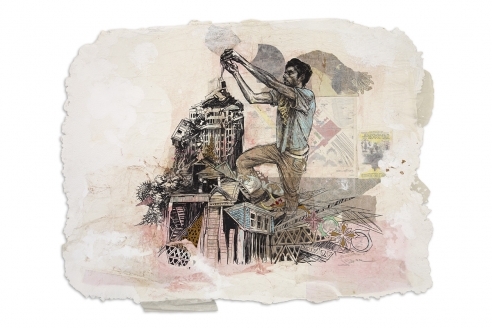 Even those closest to him have only inklings of his gleanings in concrete form, as he continues to develop a dedicated language straddling the aesthetic borders of street art and academic-grade contemporary art.